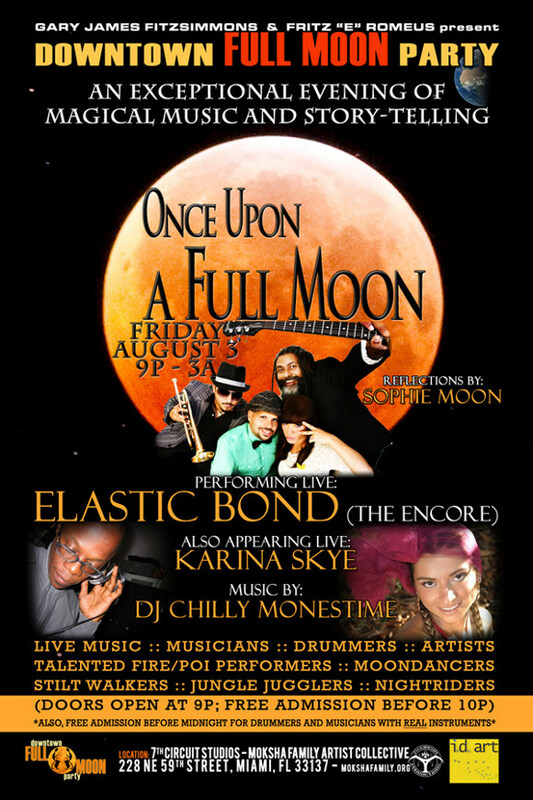 Leading our entertainment line-up for our next event is one of Miami’s most prolific and eclectic bands: ELASTIC BOND. Their last performance at the “downtown FULL MOON party” was a huge hit, and they are set for a long, extended, Encore Set that will not disappoint. Also, we will have another great talented Singer: KARINA SKYE who will be blessing us with her sultry voice and acoustic guitar accompaniment. In addition, SOPHIE MOON returns with her words of Reflection. Get ready to dance in the inside area with DJ CHILLY; his first time playing at the “downtown FULL MOON party“, and he is all set to impress!!! We will be taking a Group Photo at midnight during each of our events. This photo op is opened to everyone who would like to have a nice memory of the party; sorta like your school class picture, but much koooler, of course! All photographers are invited to snap away during this “Get-Together”. Everyone will gather on the stage, at the bottom, and around to say “CHEEEEZE”, or “downtown FULL MOON party”! So, get there before the clock strikes midnight and be part of the CLASS OF AUGUST ’12. ALL PROFESSIONAL TALENTS ARE WELCOMED!!! Bring your drum and let your beats be heard!!! The Extended Drumming set will start sometime after 10p – until… Come early to enjoy as much of this as possible. BE ARTISTIC, OUTRAGEOUS, and CREATIVE!! !